Guinea pigs have long been used in scientific research and in our everyday conversations. Why this one is in a tea cup ... is a really good question. Each week, we explain where American English expressions come from and how to use them. Today, we turn once again to the animal world. We talk about an animal that has been a great service to humanity: the Guinea pig. Guinea pigs are native to South America. Some people say the small, very social creatures got their name from the fact that they make noises like a pig. Another reason, they say, is that guinea pigs first left their homeland on ships that sailed between South America, Guinea and Britain. Over the years, guinea pigs have earned our respect. They have, after all, played an important part in keeping people healthy. For two centuries, they have been used for medical research. Their natural defenses against disease are similar to that of human beings. Scientists used guinea pigs in early studies of infectious diseases, such as tuberculosis and diphtheria. Today they are often used in studies of sexually transmitted and other infectious diseases. Rats have also been used in many scientific experiments. 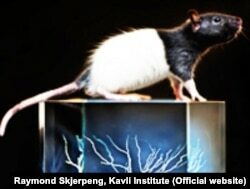 Rats are also used for laboratory experiments. But, as it turns out, Guinea pigs have more in common with people than rats do. So they are a better choice for some studies. These experiments have led to the use of “guinea pig” in the English language. Some say that the term guinea pig, meaning “one subjected to an experiment,” was first used in the 1920s. And this expression is still very common today. If someone calls me a “guinea pig,” it means that new ideas or methods are tested on me. I am part of some kind of experiment and it does not have to be one in a laboratory. Let’s hear this expression used in some examples. I have some new dishes to serve at my big dinner party! But I’ve never made them before. What if they don’t taste good? How about if I come over this weekend and you can cook them for me? Great idea! You can be my guinea pig! You can call me whatever you want. As long as I get to eat your great cooking! This milk smells funny. Will you try it and see if it’s old? Ew. No! I’m not your guinea pig. Try it yourself! The city government is trying out a new recycling program. It is the first of its kind in the nation. Argh. Not again! Why must our city be a guinea pig for every ‘great’ idea our politicians hear about? And yes, I said ‘great’ with quotes because they’re not great at all! Yes. I heard your quotation marks. The expression, “guinea pig” carries a lot of meaning with only two words. Calling yourself a “test subject,” sounds way too scientific. And we just do not use it that way. A similar term, “lab rat,” is rarely used and it does not sound very nice. And saying that you “are being experimented on to see if something works” is so very…long. Guinea pig is much more common and you can use it in any situation. Well, the only time you may not want to use “guinea pig'” to mean a lab animal, is when speaking to someone from PETA, People for the Ethical Treatment of Animals. They may not like it. Another person who may not like this expression is someone who takes care of one as a pet. That’s right. These animals do much more than help in scientific research. In the United States, many people own one or more guinea pigs, much like you would a dog or cat! And that’s all the time we have for Words and Their Stories. Until next time! I’m Anna Matteo. Do you use the term “guinea pig” the same way in your language? Or do express this meaning a different way? Let us know in the Comments Section. Anna Matteo wrote this story. The editor was George Grow. The song at the end is “Dr. Heckyll and Mr. Jive” by Men at Work.